This month, we come to the end of CISA’s 25th anniversary year. This landmark has given us the opportunity to reflect on how our local food and farm system has changed in recent decades, and to look ahead to new challenges and work. It also invites thoughts about change itself: how individuals can spark change, how collaboration carries it forward and how institutionalization can protect and sustain that change. The Healthy Incentives Program (HIP) exemplifies this process. For years, individual farmers and farmers’ markets in our region have grappled with the question of how to make their markets more accessible to people with low incomes, and how to make local food affordable without underpaying farmers. In the late 1990s, states began shifting from paper food stamps to electronic benefit transfer cards. Farmers and farmers’ markets lacked the machinery necessary to process EBT cards, so they were unable to accept these benefits for several years. In the mid 2000s, the USDA invested in making the equipment that can process these benefits — now called SNAP — available to farmers and farmers’ markets. This new technological capability, coupled with SNAP matching grants made available to farmers’ markets by a national foundation starting in 2008, invited countless people into their local markets, gave markets and vendors the opportunity to build relationships with new customers, and showed skeptics that there is demand across income levels for fresh, high-quality food. As funding for SNAP matching programs dwindled, another period of instability and inequity followed for farmers’ markets and the communities they serve. Some markets were able to conduct independent fundraising campaigns, and many weren’t. As the result of many market manager-led conversations about this problem, CISA was able to fund a Valley-wide match program called SNAP & Save, which ran in 2015 and 2016. 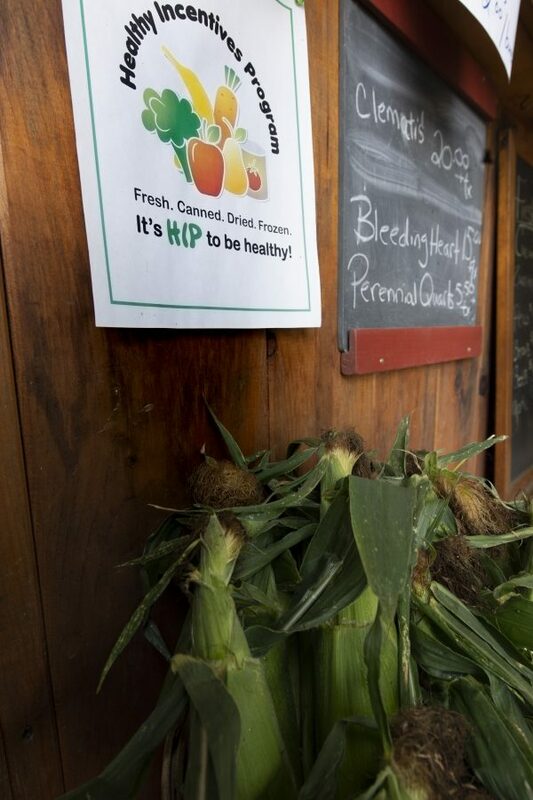 Meanwhile, in 2012, Hampden County was selected to be the test site for a federally funded research project called the Healthy Incentives Pilot, which offered SNAP customers an instant rebate when they purchased fruits and vegetables. This pilot showed that offering a financial incentive did lead to increased purchases of produce, and its success paved the way for the Healthy Incentives Program, a state-wide program that launched in 2017. Since HIP’s inception, SNAP customers have purchased $6.7 million in fresh, healthy food directly from more than 200 local farmers. HIP is not permanently funded by the state, and the program is slated to go on hiatus at the end of February 2019. Many people, including farmers and SNAP customers, are advocating to keep this program running year-round. So this story isn’t over — and, indeed, HIP alone doesn’t address all of the complex and intertwined issues of hunger, food access, and the cost of food. But it does stand as an example of the slow, non-linear trajectory of change in our food system: from individual markets instituting short-term, experimental programs, which led to more collaborative approaches, which paved the way for a state-funded and state-wide, and hopefully more permanent, solution. As an early model, the success of HIP has national implications. The last 25 years have brought so many more examples of individuals seeing a need and demanding change, coalitions forming, and regulatory or systemic change resulting. And the future holds untold new challenges, unanswered questions, and profound transformations. One current example is the ongoing financial challenges that dairy farmers in the Northeast face. The federal dairy pricing structure poses an existential threat to that vital industry, which has sparked new advocacy efforts among farmers and their supporters. This work must coalesce into systemic change if dairy farming is to survive in our region. Similarly, the most recent federal Climate Change Assessment, released in November, shows that our region has already begun to feel the effects of climate change and that we face acute climate disruption in the coming years. Farmers will need support adapting to these changes, even as we advocate for mitigation strategies on governmental and institutional levels. Working to institutionalize a local food economy that benefits all of us — sustaining farmers and farm workers; feeding families, schoolchildren, and communities; stewarding our land base and righting the inequities that currently skew land ownership to white Americans — will require lots of creativity, collaboration, and systemic change. At CISA, an organization that is itself the result of a group of people coming together to address a need, we look forward to 25 more years (and beyond!) of positive change.